First, I would like readers to see my authentic Kenya birth certificate, and my cat's authentic Kenya birth certificate. I also have Sarah Palin's Kenya birth certificate. 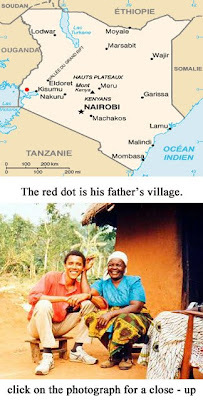 Another Kenya birth certificate for Obama has been announced by grifter Ed Hale, who is charging his marks $100 to look at it. They have to send him the money by PayPal, and he will send the mark a password for a website which has the image of this latest certificate - at the end of the month. Expect shills' testimony, of its authenticity, on his website. Got it? Philip Berg, a lawyer in Lafayette Hill, Pennsylvania, is still beating this dead horse. As is Joseph Farah, and Orly Taitz. So what does their scenario look like? And what would travel to Kenya have been like, for a woman in her third trimester of pregnancy, in 1961? Would Barack Sr. even take a white pregnant wife to Kenya? First, his father was adamantly against inter-marriage. Second, he was already married to a woman in his village. And Ann Dunham could not have gone to Kenya without a yellow fever vaccination - which cannot be given to a pregnant woman. She would also need hepatitis A, typhoid, diphtheria, and tetanus vaccinations, and a polio booster. Well, Phil and his coterie are still insisting she went. So how did they get there? That's five days, plus layovers. The New York - London - Nairobi legs would have been on a BOAC Viscount 810, a prop plane with a top speed of 200 MPH. In 1961, Honolulu - Nairobi RT airfare was £476. That's £7,335, or $11, 025 in constant dollars - each person. Ann and Barack Sr. would have had to pay $22, 050 cash on the barrel head. Per capita income in 1959 in Hawaii was $1,863 or $13,872 in constant dollars. In other words, two tickets would have been a year's salary from each of her parents. How would have they have notified Ann's mother to register their baby's birth, in Hawaii? By telephone? Sorry, trans-Atlantic telephone service did not begin until December, 1961. The only way was by cable. In 1961, a cable cost 15 shillings per word. In constant dollars, that's $19.29 per word. To send a cable, Barack Sr. would have gone to a Mombasa telegraph office, which would have wired Nairobi, which would have sent a cable to Western Union, which finally would have delivered a telegram to her parents. And if Madelyn Dunham had walked into the Department Of Health on Punchbowl Street, and said she wanted to register a birth, there would have been an investigation - it's not like getting a dog license. Newspaper birth announcements are obtained from the hospital. Madelyn Dunham could not have called both papers and have it placed like a wedding announcement. So Ann, in her third trimester, and Barack Sr. have arrived in Nairobi, after seven days of constant air travel on a cramped prop plane. Now they have to get to Nyang'oma Kogelo, 402km away, where Barack Sr. has a wife he married before going to the States. Crazier things have happened. The only way was the train to Kisumu, an overnight trip with frequent stops for animals on the tracks. And then they had to travel over dirt roads for 60km, to his village on the equator - where his family lived in a thatched roof hut, without electricity or telephone. Normally, the story would have ended there, because his father would have hit him, and his village wife would have killed him, for showing up with a pregnant white wife. Well, I guess they all got along. As I said, crazier things have happened. Then, Barack Sr. and Ann decided to go to Mombasa, leaving his village wife behind. So, another 60km trip over dirt roads back to Kisumu, for the train to Mombasa - a 1,169km trip. Once they were in Mombasa, Ann started to go into labor. She went to the hospital there, which got its electricity from a cable strung along trees. After Ann delivered the baby, under conditions she never would have in the States, they headed back to Honolulu - an overnight train to Nairobi, then one week of constant travel with a newborn, a diaper case, and luggage. Then they had to get Barack Jr. into the country, without a passport. A family passport, perhaps? Sorry, you need a family to get one. The mother was photographed with her child or children, and it was not issued in anticipation. Ann would have to be photographed holding Barack Jr. to be issued one. Perhaps she got him into the States some other way? Sorry, our president registered for the Selective Service as required. So Ed Hale, Philip Berg, Joseph Farah, Orly Taitz and the rest of their coterie have a tale that belongs in the fiction section, along with the rest of the potboilers, waiting to be remaindered. The Denialists are a motley crew of grifters, felons, malcontents, anti-Semites and sore losers. James Manning, the latest to get on the crazy train, has a lengthy criminal record: he burgled homes, mostly on Long Island, and spent about 3½ years in prison in NY and Florida for burglary, robbery, larceny, criminal possession of a weapon, and other charges. Gary Kreep's infomercials are produced and hosted by Bill Keller, a fundamentalist minister who was imprisoned in the late '80s for an insider trading conviction. Andy Martin is a vicious anti-Semite, who never finished a prison sentence after being mistakenly released. Orly Taitz's antics could fill a library. Before she became the crazy train conductor, she already had been personally involved in 22 lawsuits in Orange County civil court. Her law degree is from the Taft Law School, an unaccredited correspondence outfit. And a $20,000 court sanction is hanging over her. Very nice Misha. I hadn’t thought about the vaccines, excellent point. I went to South Africa several years ago to travel (and work) aboard the Phelophepa traveling medical train, which goes to remote places to give care to those who may not have any other access. The lady at the health department told me that if I didn’t get the shot, I would still be able to get there, but without the seal on my shot records I would not be allowed to return. I also gave birth to my youngest son in Japan. (We were military and lived there) I was not allowed to take the baby out of the country until he had a passport, which I couldn’t get without a birth certificate. Getting that was very difficult, I had to apply to the American Embassy in Tokyo and provide a crap load of documentation both on myself, and his father that we had to send to the states to get. It took nearly 4 months all together. Not to mention, you are correct that no airline would have let her fly on a trip that long when she was so far along. Hell, it took me two days to get there just a few years ago.